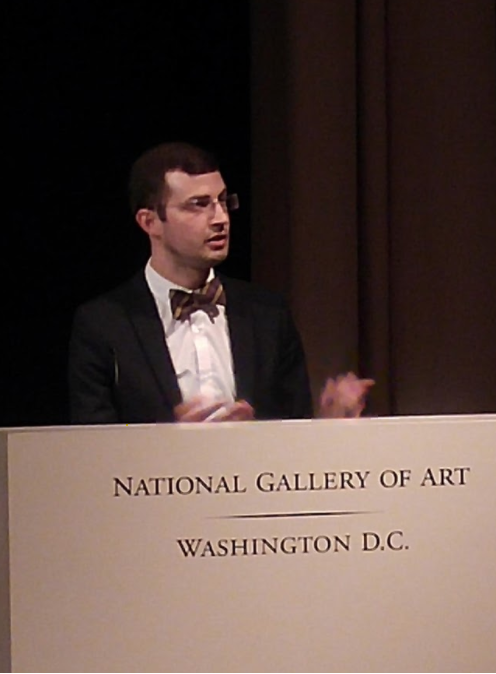 Image from the lecture presentation. The print of Paul Preaching in Athens is on the left, and the copied composition in maiolica is on the right. 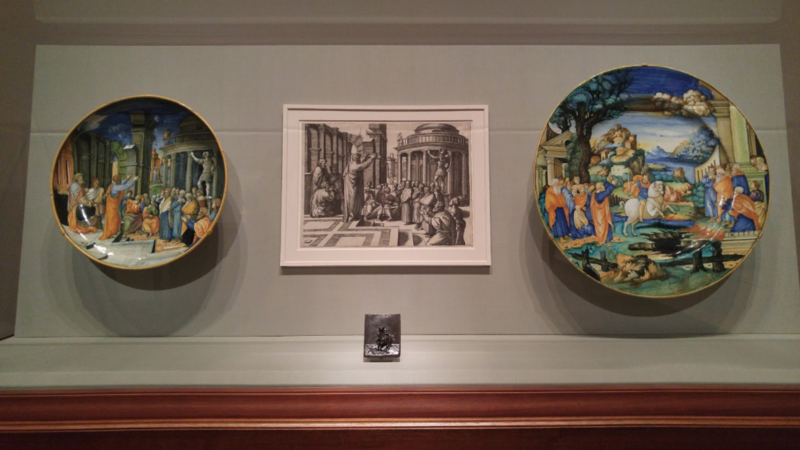 Print, bronze, and maiolica interpretations of Raphael’s Paul Preaching in Athens on display in the National Gallery of Art. 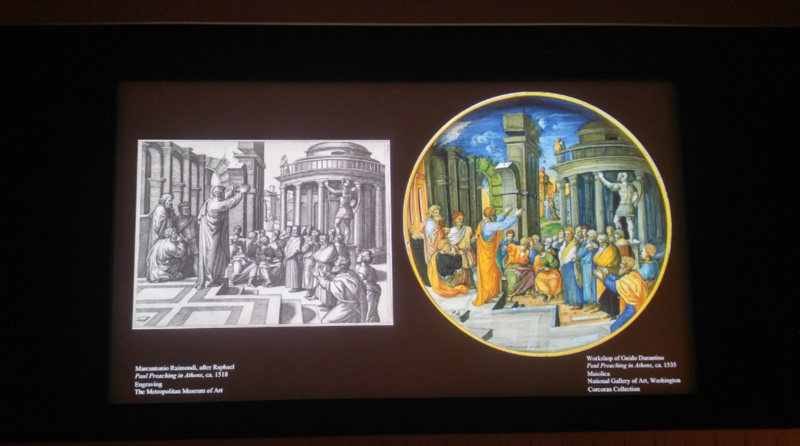 It is clear from the examples Gabbarelli shared during his lecture that reinterpretations of renowned works by Italian artists such as Michelangelo Buonarrotti and Raphael were stamped into bronze or reinvented on maiolica, or tin-glazed pottery. Single sheet prints guided and educated other artists in Europe, which made visual echoes of Michelangelo accessible to those of moderate means. Due to erroneous interpretation, Michelangelo was skeptical of prints and discouraged the reproductions made of his works. However, Raphael “embraced the new medium of prints, as they would help him spread his own fame and influence,” according to Gabbarelli. Raphael was correct in his prediction, and his name became almost synonymous with maiolica. Gabbarelli’s exhibit, the first of it’s kind in the United States, includes some 90 prints, plaquettes, and istoriato-style plates based on the same famous works of art, allowing the viewer to see interpretations and reinterpretations of recognizable themes from Renaissance Italy side by side. Maiolica and bronze plaquettes were the two media most dramatically influenced by the new technology of image replication. The word “istoriato” refers to the style of the decoration on Italian maiolica pottery, usually with a mythical, historical, or biblical subject. For example, in 1515 Raphael designed a set of ten tapestries for the walls of the Sistine Chapel in the Vatican. One subject was a story from the Bible in which Paul visited Athens and preached against the worship of false idols. These designs were engraved and published in Rome, and served as the main source of knowledge about Raphael’s tapestries. Only the five compositions that appeared in print were copied onto maiolica. Some of the craftsmen duplicated the entire composition on their plates, others created new settings or different subjects altogether. One painter inserted the ancient Roman hero Marcus Curtius on horseback in the middle of the image. The exhibit also focuses on the designs of other major Italian artists, such as Andrea Mantegna, Antonio del Pollaiuolo, and Parmigianino. 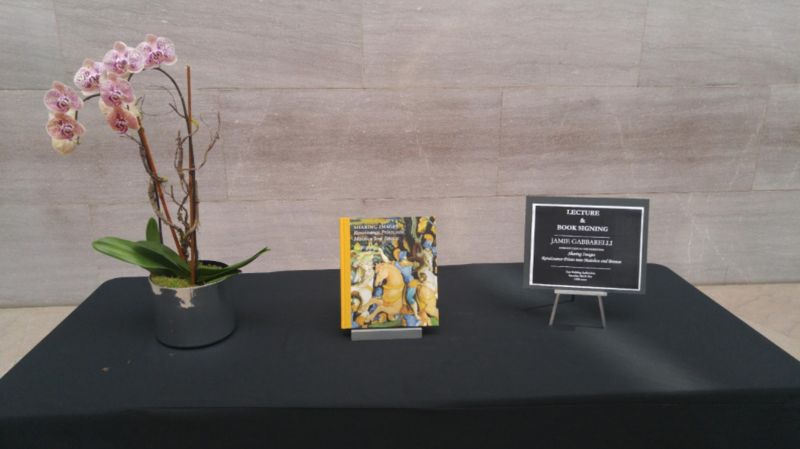 Albrecht Dürer, a German Renaissance painter and printmaker, is also featured in the exhibit, demonstrating the geographical boundaries the ceramics and bronze reliefs were able to cross. Gabbarelli effectively posits through his lecture and exhibit that “images transform the world around them when copied and shared,” and perhaps even when reinterpreted. This was certainly true in artistic exchanges between Italy and Northern Europe during the Renaissance. A native of Assisi, Italy (a dual Italian and British national), Gabbarelli was inspired by the ceramics and maiolica pottery of Central Italy to put together this exhibit, and research the relationship between prints and other media. His exhibition is accompanied by a catalog he authored, and generously signed for all those in attendance after his lecture, of the same name. 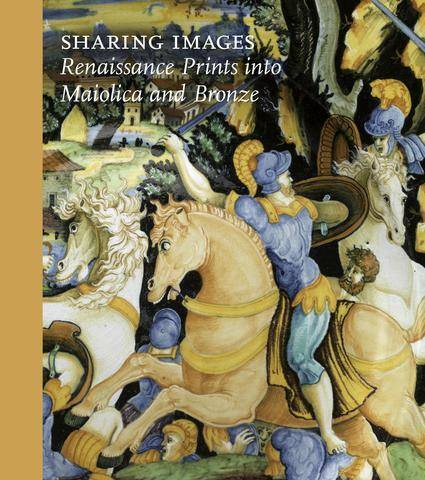 Sharing Images: Renaissance Prints into Maiolica and Bronze is open until August 5 in the West Building on the Ground Floor of the National Gallery of Art, and included in both English and Italian language tours of the museum.